Semi-Markov chains (SMCs) are continuous-time probabilistic transition systems where the residence time on states is governed by generic distributions on the positive real line. 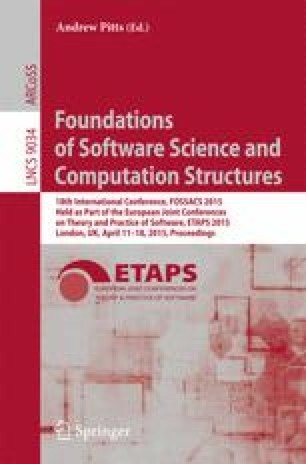 This paper shows the tight relation between the total variation distance on SMCs and their model checking problem over linear real-time specifications. Specifically, we prove that the total variation between two SMCs coincides with the maximal difference w.r.t. the likelihood of satisfying arbitrary MTL formulas or ω-languages recognized by timed automata. Computing this distance (i.e., solving its threshold problem) is NP-hard and its decidability is an open problem. Nevertheless, we propose an algorithm for approximating it with arbitrary precision. Work supported by the European Union 7th Framework Programme (FP7/2007-2013) under Grants Agreement nr. 318490 (SENSATION), nr. 601148 (CASSTING) and by the Sino-Danish Basic Research Center IDEA4CPS funded by the Danish National Research Foundation and the National Science Foundation China.